All under one roof, the centre comprises a Main Arena (70m x 30m) with tiered seating for up to 200 people, but with the capacity to seat 1500 if required. Linked by a rubberised walkway, we also have a Warm Up Arena (55m x 20m) with both areas being surfaced with Andrews Bowen Pro-Wax. The judges and commentators box features the latest PA system, together with a bird’s eye view over the main arena. The arena has two show offices one is conveniently situated next to the collecting ring and is wired for internet and wi-fi access, and the other is located upstairs within the café area, over looking the arena. We have extensive hard standing parking for horseboxes with a non-slip walkway access to the collecting ring, together with free car parking and good disabled access to the arena. We have on site permanent stabling for 160 horses with a solarium and wash down facilities available within the racecourse grounds, together with basic lodge accommodation and a canteen when staying over at shows of a duration of two days or more. There is also the space to have additional temporary stabling, if required. The arena is also suitable for hosting horse sales, equine trade related events, clinics and can be easily adapted to suit all requirements. The arena is easily transformed into 3700sq metres of exhibition space with the simple installation of the latest plastic hard floor covering the surfaces. 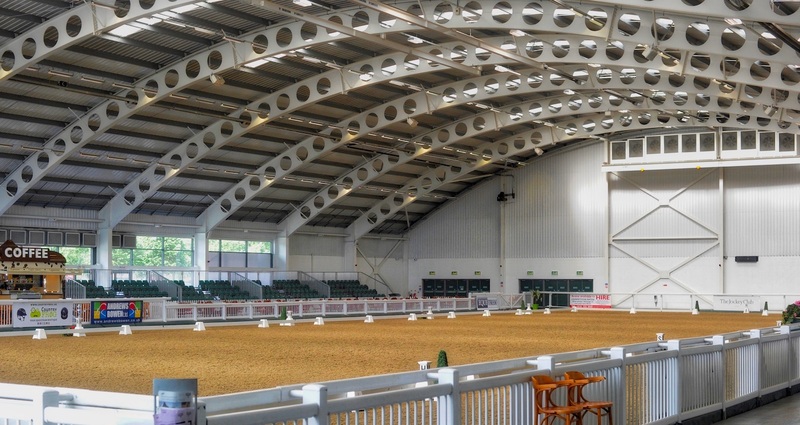 The arena is also suitable for hosting horse sales, equine trade related events, external shows & clinics and can be easily adapted to suit all requirements. The arena is easily transformed into 3700sq metres of exhibition space with the simple installation of the latest plastic hard floor covering the surfaces. For more information on and full details please contact us.